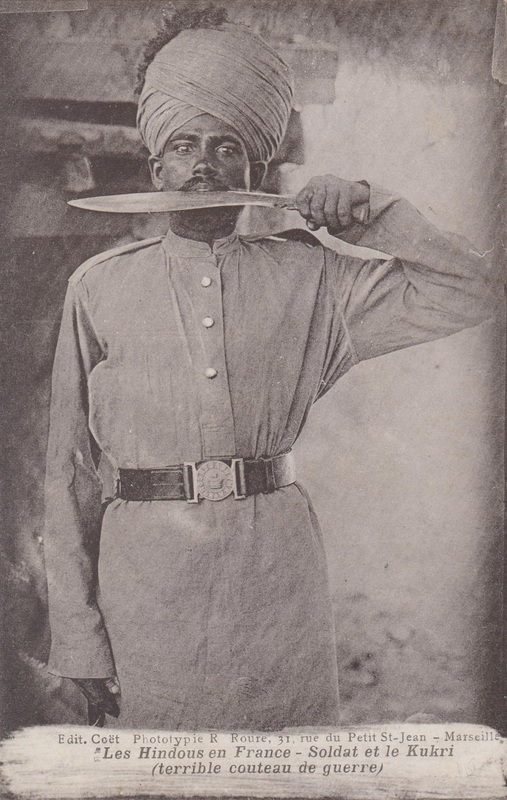 French postcard sold in Marseille (circa 1915) showing a “Hindu” member of the Indian Army Bearer Corp (note the belt buckle) holding a kukri. Source: Author’s personal collection. As regular readers will know, I have a keen interest in both the history of bladed weapons and vintage postcards. The kukri, a type of fighting knife from Nepal made famous by Gurkha troops serving with both the Indian and British armies, has been one of my many areas of interest and study. The few posts I have written on these weapons have been some of the most popular ever published at Kung Fu Tea. A few weeks ago it occurred to me that I had yet to address kukris as they appeared in the popular culture and ephemera of the early and mid twentieth century. As always, vintage postcards provide a unique window onto this subject. In the following post I would like to share three images taken from my collection. Initially I acquired these postcards because they provided an interesting look at some historic weapons. But their actual value goes far beyond any technical information that they might convey about the knives themselves. Each of these images is also a record of a social moment in time. Together they illustrate some of the ways in the kukri has been used as a signifier of difference, nation, heterogeneity, ethnicity, authority and “otherness.” While I am always interested in the practical application of various weapon skills, the social scientist in me is equally fixated on the many discourses that have come to be bound up with these artifacts. Our first image (found at the head of this post) is perhaps the best know of those that I will be sharing today. Dedicated kukri collectors and students of Indian/Nepalese military history may have run across this picture before, but I suspect that most readers will be encountering it for the fist time. The massive mobilization of troops necessary to fight World War One (WWI) brought individuals from many nations and ethnicities to the trenches of Europe. Postcards showing the diverse uniforms and weapons of the various troops become common souvenirs as the war progressed. In addition to the expected western (French, Scottish, Australian, Italian….) armies, some postcards from this period also featured more exotic forces including the Chinese labor corp and various colonial troops. 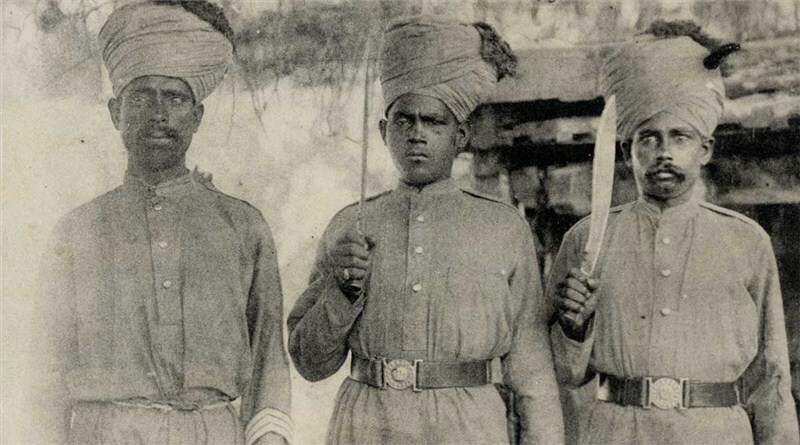 A number of these later images focused on the different sorts of soldiers found within the Indian Army. The preceding postcard (printed in Marseille around 1915) is a classic example of the genera. Unfortunately it doesn’t provide any detailed information about the soldier in question. Rather than listing his nationality, rank or even branch of service, he is described simply as a “Hindu soldier” in France. Yet even this limited information is of dubious value. His belt buckle denotes that he is part of the “Army Bearer Corp” (ABC) This was an element of the Indian Army sent to Europe to serve along side British forces. The ABC was composed of non-combat troops who (as their title suggests) was tasked with moving equipment and other sorts of labor. In practice they seem to have spent quite a bit of time carrying wounded soldiers off the battlefield in stretchers and incurred their own losses (sometimes heavy) while doing so. Longtime kukri researcher “Spiral” at IKRHS has had a chance to look at a number of knives carried by this group as well as their social composition. He points out that the ABC was internally quite diverse. While formally a unit within the Indian Army, it also contained a variety of troops that had been seconded out from the Royal Nepalese Army. The turban in the photo might suggest that the individual was a Sikh (though he is lacking a beard). In fact it was simply a part of the standard ABC uniform. In addition to coming from multiple nations, ABC troops might be Hindu, Sikh, Muslims, Christian converts or any number of other things. This brings us to the soldier’s signature weapon, his kukri. This sidearm became synonymous with troops from Nepal and India, even though only certain units actually carried them. It goes without saying that these knives were not generally carried in the mouth, but rather in standard issue sheaths and frogs. Still, the exotic pose seems calculated to invoke stories of the superhuman bravery and aggression that Gurkha troops have long been known for. The irony is that the individual posing for this photograph is a member of the labor corp and a non-combatant in the classic sense of the term. Another photograph, often labeled “Indian Troops in France” which features the same individual. You can see the profile of his knife blade better in this shot, strongly suggesting that his weapon is the variant of the MKI service kukri that was produced at Fort William. Source: Old Indian Photos (Public Domain). The following picture offers us a better look at the same blade. It shows three members of the ABC, two of whom are holding kukris. The individual at the far right of this photograph appears to be the same as the the subject of the preceding image. While not as deep across the belly as some WWI MKIs, I suspect that this is probably what we are looking at. In both of these (European produced) images, the kukri is held aloft to identify what the soldier “really is.” Yet it also serves to erase the very markers of nation, ethnicity, religion and even unit of military service that these postcards claimed to record. Hill Types of Nepal. Probably produced in the 1960s. Source: Author’s Personal Collection. The second image was produced under very different circumstances and provides an important contrast with the first. While marketed to the public as a “postcard” this particular object is actually a glossy black and white image printed on heavy photographic paper of exactly the same type that you might have used when developing film. A postcard “mailing template” has been somewhat poorly stamped onto the back of this image. In that sense it is technically a postcard. Yet when you hold the object it is clear that this was actually a photograph reproduced for sale at the Das Studio in Darjeeling (a city in West Bengal close to the Nepalese border). Das Studio was first established as a family business in 1927 and readers might be interested to know that it is still operating as such today. I have not been able to locate this particular image in their online archive, but my best guess is that it dates to the 1960s. While the previous pictures tends to collapse any specific local identity, this image both celebrates and constructs it through the use of traditional clothing and the prominent display of kukris. These are carried in the conventional manner (stuck through a sash around the waste) rather than in an exaggerated pose. While we don’t have any information about the blades themselves, each of these knives would probably fall into the broad category that modern collectors refer to as “villager kukri.” As is evident from the photograph above, many of these civilian knives are very interesting, and the one carried by the individuals third from the left seems to be of exceptional length. Where as western photographers used the kukri to construct an artificial image of the entire Indian subcontinent, here we see a much more specific community displaying the same weapon as an enactment of their own identity. 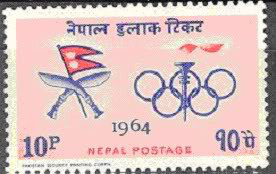 A 1964 Nepalese Postage Stamp showing both the Olympic Rings and crossed kukri. The last image is not actually of a postcard, but rather the thing that gives them mobility. This postage stamp was released by the government of Nepal in 1964. As should be evident from the rings and torch, it was commissioned to honor the games held in Tokyo. These were the first Olympics to be hosted in Asia. Readers may also recall that they were the games in which Judo made its initial debut. The 1964 games were also the first in which Nepal competed. The mountain kingdom’s initial Olympic delegation consisted of a pair of marathon runners and four boxers. Military service had long defined the image of Nepal’s physical culture on the world stage. Of course the kukri itself had become deeply entwined with this military tradition. Perhaps it should not be a surprise then that this familiar symbol was once again invoked to represent the Nepalese nation in its Olympic debut. In addition to introducing some classic images of kukris, the preceding post reminds us that symbols are fundamentally multi-vocal. The kukri has never had just one social meaning. 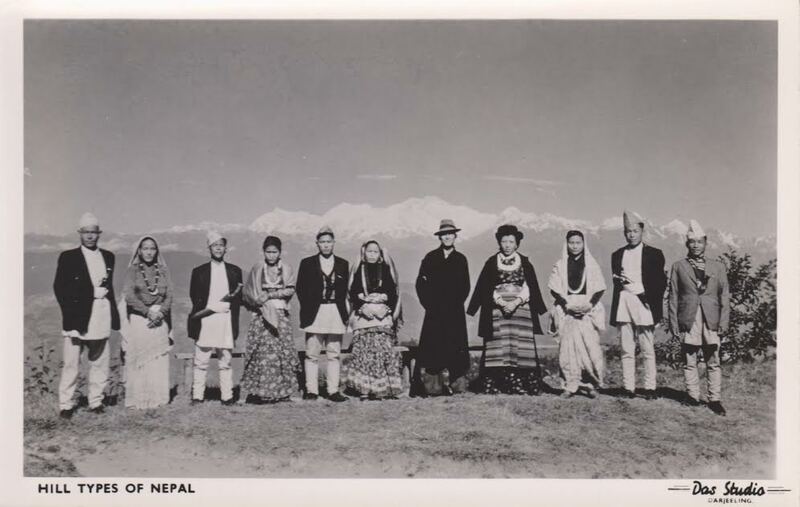 In the hands of early 20th century European photographers it became a tool of Said’s “Orientalism.” To the Gorkha communities in the hills of Darjeeling it was a much more specific ethnic marker and even a sign of nationalist longing. Finally, when marshaled by the state this quintessentially Nepalese weapon could even mark Nepal’s first steps into global civilian athletic competition. Nor do these three very different examples begin to exhaust the many meanings which the kukri has come to acquire in Nepalese culture and politics. In the final analysis the study of weaponry is simply the study of the society that produced it. If you enjoyed this post you might also want to read: Through a Lens Darkly (19): China’s other Swords during World War II. Hi Ben, Great article! I enjoyed reading it. And includes further link to there published 1906 history including kukri references. Spiral, its good to see you. Thanks for posting the link and dropping by!